Experiment with impact-based agreements to align policy, funding, and actions to drive progress toward an AIDS transition, with attention to rights and gender issues. Measure what matters — new infections and AIDS-related mortality — to achieve maximum value for spending through better targeting and alignment of financial support with countries’ own financial commitments and progress on prevention and treatment. Create incentives for co-financing by committing to a floor of support in hard-hit countries and developing matching funds for each additional person tested or on treatment. Remarkable progress has been made in the global fight against HIV/AIDS. The number of people receiving treatment in low- and middle-income countries increased from 300,000 in 2003 to 13.7 million in 2015, including 7 million supported by the United States. AIDS-related deaths have dropped by 29 percent since 2005. These gains are primarily attributable to a 2003 US government initiative called PEPFAR (the President’s Emergency Plan for AIDS Relief) that provided major new multiyear funding for global HIV/AIDS and created a new entity, the Office of the Global AIDS Coordinator, headed by an ambassador-rank Global AIDS Coordinator who is authorized to allocate PEPFAR’s resources and coordinate all US bilateral and multilateral activities on HIV/AIDS. The Global AIDS Coordinator has wide authority over HIV/AIDS activities implemented by the US Agency for International Development (USAID), the US Department of Health and Human Services (primarily through the Centers for Disease Control and Prevention [CDC], the Health Resources and Services Administration, and the National Institutes of Health [NIH]), the Departments of Labor, Commerce, and Defense, and the Peace Corps. US leadership is recognized worldwide as having spurred an unprecedented surge in political commitment, global spending, and scientific advancement, which has transformed AIDS from a death sentence into a manageable disease. More US foreign assistance spending, $8.4 billion in 2014, is devoted to health objectives than to any other broad category (the bottom bar in the left panel of figure 1). PEPFAR funding to combat the HIV/AIDS epidemic includes not only $6 billion from the foreign assistance budget, but also an additional $580 million channeled through the NIH and the CDC (right panel of figure 1). PEPFAR is one of a very few bipartisan development priorities, with executive and congressional leaders in both political parties generally agreeing on the program’s objectives and strategy. Perhaps as a result of this rare political collaboration, the program is the largest foreign assistance program in history to address a single health issue and has spent a total of $51 billion from its launch in 2004 through the end of 2014, with $6.6 billion authorized for 2015 and $6.3 billion requested for 2016 (figure 2). PEPFAR’s importance to US foreign assistance policy derives not only from its size but also from several other unusual or unique characteristics. It is the only foreign assistance program that directly provides long-term medical treatment, thus arguably endowing those patients with a virtual entitlement to continued US support. PEPFAR is also the vehicle through which the United States is experimenting with channeling foreign assistance through the Global Fund, a multilateral institution quite different from the traditional Bretton Woods ones like the World Bank. Along with the Millennium Challenge Corporation, another innovative foreign assistance program, PEPFAR sits outside of USAID and thus has the freedom to adopt new approaches to improving the effectiveness of foreign assistance. Like the Department of Homeland Security, PEPFAR attempts to rationalize and coordinate government bureaucracy, in its case by organizing HIV/AIDS-related programming across multiple government agencies, including not only the State Department, USAID, and the CDC but also Health and Human Services, the Department of Defense, and the NIH. Furthermore, the United States provides nearly two-thirds of all international assistance for HIV/AIDS, which together with its 33 percent contribution to the Global Fund makes its support critical to the sustainability of the global effort against AIDS. All of these features together suggest that whether PEPFAR continues to succeed or is humbled by its growing challenges will have repercussions for good or ill not only on the United States’ international reputation but also on the effectiveness of its foreign assistance policy overall. specifying future US commitments to focus countries as a foundation for strengthening co-financing schemes. PEPFAR-supported treatment is working and has reversed the death toll. But the fact is that HIV prevention has not worked well enough, so the number of people living with HIV/AIDS has continued to rise (see figure 3 and table 1). For countries with large and growing treatment burdens, the pivotal challenge for the country, and for the United States as well, will be to push new infections below AIDS mortality. The political reality is that unless this challenge is adequately addressed, the US government will face large, endless fiscal outlays for what has become an international entitlement program. To begin to address this challenge, in 2015 PEPFAR announced a new strategy (“PEPFAR 3.0”) with a goal of “epidemic control” and broader aspirations of achieving an AIDS-free generation. PEPFAR defines epidemic control as the point where new HIV infections fall below the number of AIDS-related deaths. Epidemic control is the only way to reduce the actual size of the HIV/AIDS burden on partner countries and on the donor governments that support them, and the only way to eventually achieve an AIDS-free generation. Achievement of epidemic control or an “AIDS transition” depends vitally on PEPFAR’s ability to work with its partners — recipient governments, its grantees and contractors, and the Global Fund — in every partner country, aligning and fine-tuning efforts and incentives in support of that single goal. This will mean ensuring that partner countries and funding agencies — and ideally related agencies such as UNAIDS and the World Health Organization — share the vision of an AIDS transition. This includes moving scarce resources toward the most cost-effective prevention and treatment combinations in key populations that will get to goal as quickly and inexpensively as possible, while simultaneously respecting human rights and gender issues. Current spending and allocation is under study within PEPFAR, and early decisions to refocus resources have been taken. However, recipient government spending and Global Fund resource allocation practices are less well known at this time. Recent research suggests that some aspects may still be inconsistent with a transition goal. Specifically, patient retention on antiretrovirals varies widely, as do costs associated with delivery, while some key prevention interventions such as circumcision remain at low coverage. This suggests that aspects of programmatic quality and effectiveness will require greater attention. Within the PEPFAR ecosystem of partners and implementers, setting up grant agreements or contracts that generate better incentives to align PEPFAR technical assistance and research partners’ support to implementing partners with the same goal in mind are also needed. A new strategy, however, requires new data to be successful. Better measurement is needed to more accurately estimate the two variables that will define success at epidemic control: the mortality of HIV-infected populations and new HIV infections. Currently, data collection is focused on enrollment of patients into antiretroviral treatment, alongside a large number of operational and service-readiness measures. While these latter data are essential for management and oversight purposes, mortality and new infections are the underlying drivers of program success. Therefore, they should be better measured on an ongoing basis. Consistent with its goal to improve the quality of AIDS treatment, and thereby enable treatment as a means of preventing new transmission, PEPFAR is already working to improve monitoring of patient adherence to antiretroviral therapy. As a byproduct of that process, facilities will track patients to their homes and thus learn more about patient characteristics — for instance, whether they have simply shifted treatment facilities, have dropped out of treatment altogether and now pose a threat to potentially spread drug-resistant strains of HIV, or have since died. The new monitoring plans should bring improved data on HIV/AIDS mortality. However, a much more difficult challenge is to accurately estimate the number of new HIV infections in a given population. Since healthy people contract HIV during risky activities outside treatment facilities, new HIV infections can be accurately estimated only by population-based sampling methods. Furthermore, because HIV infection is a rare event even in highly affected countries, large samples are necessary to estimate the number of new infections with sufficient accuracy such that improvements can be detected from one survey to the next. By illustration, one study estimated that a sample size as large as 50,000 respondents might be necessary to detect a halving of the infection rate. The cost of accurate and reliable surveys is significant, even if they are inexpensive compared with the cost of antiretroviral therapy. Sufficient resources will need to be mobilized for the accurate measurement of annual infections to properly track progress toward epidemic control in each partner country. We recommend an annual budget of $5 million per country for such efforts. This would total roughly $180 million per year across PEPFAR’s 36 active country programs. Although this seems like a large expenditure in absolute terms for monitoring surveys, the data would provide PEPFAR and recipient countries with a chance to bend down the curve on billions of dollars of AIDS treatment spending over the medium to long term. More specifically, this strategic investment could lead to significantly improved epidemic control outcomes due to the resulting improvements in patient targeting both within and across focus countries, and enable future usage of outcome-based program expenditures. To date, PEPFAR has shouldered the lion’s share of AIDS treatment and prevention costs in most of its focus countries. In some countries, the US government has covered approximately 90 percent of total AIDS-related spending. Conscious of its flat funding from Congress, PEPFAR has signaled that it expects recipient countries to assume a larger share of the fiscal burden going forward. However, the incentives for those governments to assume that responsibility remain weak. Most PEPFAR recipient countries report modest increases in their domestic spending on HIV/AIDS. But to date, only the government of South Africa has assumed responsibility for specified numbers of patients, while low-income countries with high AIDS burdens remain heavily dependent on PEPFAR and Global Fund assistance. Making all of US funding conditional on recipient government co-financing is not a credible strategy because of the implicit entitlement of existing patients to continued treatment. The largest obstacle to increased HIV/AIDS spending by recipient governments is their uncertainty whether their increased spending would be offset by PEPFAR reductions, saddling them with an entitlement burden (or “contingent liability”) without actually increasing the number of patients receiving treatment. To reverse such perverse incentives, PEPFAR should clearly and transparently commit, without conditions, to a minimum or base level of AIDS treatment support in a subset of the most severely affected countries for at least a decade. By recognizing and respecting the treatment entitlements the United States has incurred, such a commitment would not only provide a baseline to which recipient governments can confidently contribute incremental funding, but also establish a floor from which the United States can offer rewards for verified success at reducing new infections. To shift incentives toward epidemic control and co-financing, PEPFAR must shift how its funding is disbursed and tracked. Currently, PEPFAR’s funding fails to encourage recipient governments to either accelerate progress toward epidemic control or assume a greater share of the responsibility and costs. 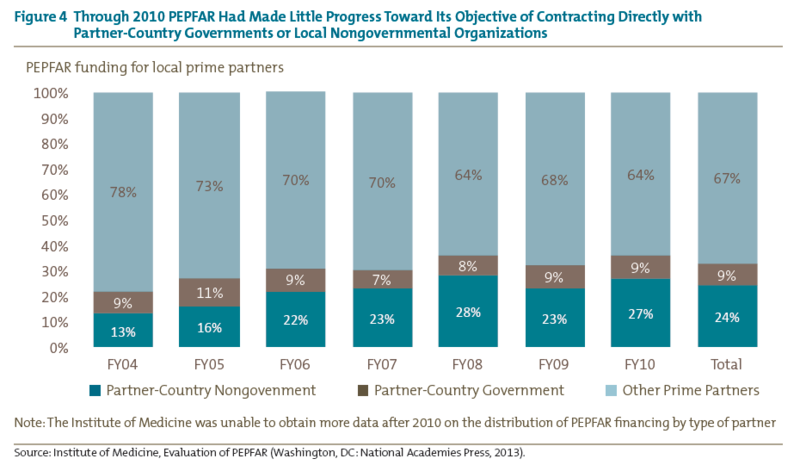 Since PEPFAR’s inception, it has preferred to implement HIV prevention and treatment programs through local and national contractors (represented by the top and bottom segments of the bars in figure 4) instead of through national governments (the thin middle segment). Although it is easier to audit and hold nonstate actors accountable — at least for narrow, contractor-specific objectives — only national governments have the authority and responsibility to be charged with bending the nationwide trends on mortality and new infections as required for epidemic control. Far from assuming a larger share of the responsibility and funding for HIV/AIDS programs, several partner-country governments have responded to donor health funding by diverting domestic resources away from health. 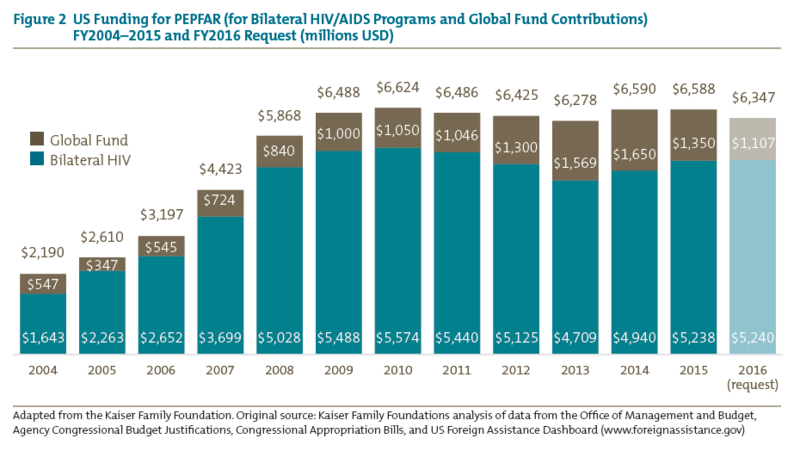 Since PEPFAR funding is subject to Congress’s annual appropriations process, recipient governments are quite rational to doubt whether PEPFAR is willing to commit either to continue funding HIV/AIDS if the recipient government starts to shoulder a greater proportion of the financing burden or to withdraw funding when the recipient government reneges on an agreement. In addition, PEPFAR’s strategy of running money largely outside of country governments to address AIDS has meant that public funds quite naturally went to other priorities. Unless PEPFAR changes these incentive structures, the US government should be expected to continue to shoulder most of the responsibility for AIDS treatment in poor countries. Therefore, while the absence of incentives not only burdens the US government — both through persistent funding requirements and lost opportunities to support other development priorities — it also will handicap efforts to truly bend the arc of AIDS within these environments. In addition, the US government may face difficult choices in several countries, where recipient governments continue to deprioritize AIDS control in favor of other priorities. Having a clear plan of action for how to address these cases will be important. Until PEPFAR policies align recipient governments’ core priorities and interests with the objective of epidemic control, those countries’ HIV/AIDS disease burden and the fiscal demands of that burden on the US government are both likely to grow. The next president has the potential to definitively contribute to controlling the AIDS epidemic throughout the world. Yet that will require a series of concerted steps and reforms concerning how the US government operates and collaborates with PEPFAR’s focus-country governments and partners. Undoubtedly, the next president must continue the United States’ strong commitment to supporting the global AIDS response and the millions of people whose lives hang in the balance. Yet to maximize the impact of US funds and accelerate progress, we recommend three strategies. 1 Experiment with impact-based agreements. Cash on Delivery Aid. Working with the Global Fund and other partners, PEPFAR could support payments to recipient governments for measurable and verifiable progress on specific outcomes, such as $100 for every HIV infection averted. By linking at least part of payments directly to a small number of specific outcomes, governments would be empowered to search for more effective ways to achieve the mutually agreed-upon outcomes. Moreover, actual progress would become more transparent to the recipient country’s citizens. To encourage the recipient government to improve the accuracy of its HIV infection monitoring, PEPFAR can link a portion of reward payments to the precision of the estimates. These structural features would serve to rebalance accountability, reduce transaction costs, build local service capacity, and encourage innovation. Like any aid approach, PEPFAR must discern whether a country’s governance structures are sufficient to support this kind of engagement without inducing human rights challenges. To mitigate that risk, certain checks and balances could be included in cash-on-delivery contracts, such as the requirement of oversight from a supervisory body or civil-society watchdog, or a provision to annul the contract in the event of discriminatory or stigmatizing behavior toward HIV-infected persons. Fixed-amount reimbursement agreements. In country programs that are not yet ready for a cash-on-delivery approach, PEPFAR could enhance incentives by paying for well-defined activities or outputs with previously agreed-upon specifications or standards. This would work particularly well for financing outputs for which cost structures are well known. 2 Collect more representative data on new infections. Specify future commitments to each focus country. In addition to all the patients PEPFAR has enrolled in treatment, the United States should unilaterally commit to support at least a fixed percentage of the new treatment requirements in each recipient country. This could vary from 20 to 80 percent depending on the current and projected US share of treatment financing within the respective country. Specifying a floor for future commitments ensures a base level of continued US support and assures the recipient country’s ministry of finance that its funding will help additional patients, instead of simply crowding out US assistance. Committing to a number of patients, rather than a minimum amount of money, allows cost reductions to free up resources for other uses. As the recipient country begins to share the fiscal burden of treatment, its financial incentives to prevent new infections will gradually increase. Leverage recipient government co-financing. Before programming its base level of country funding, PEPFAR should set aside as much as 10 percent of its total budget to reward countries that clearly mobilize additional funding for epidemic control. Possible mechanisms include block grants and other risk-sharing arrangements like those used in the US Medicaid program, where states match federal outlays on a dollar-for-dollar basis. Importantly, however, grant-matching programs should allow innovative local implementation and be accompanied by incentives for efficiency and impact. Nancy Birdsall and William Savedoff. Cash on Delivery: A New Approach to Foreign Aid. Washington: Center for Global Development, 2010. Amanda Glassman and Jenny Ottenhoff. Clear Direction for a New Decade: Priorities for PEPFAR and the Next US Global AIDS Coordinator. Washington: Center for Global Development, 2013. Institute of Medicine. Evaluation of PEPFAR. Washington: National Academies Press, 2013. Mead Over. Achieving an AIDS Transition: Preventing Infections to Sustain Treatment. Washington: Center for Global Development, 2011. US Government Accountability Office. President’s Emergency Plan for AIDS Relief: Shift Towards Partner-Country Treatment Programs Will Require Better Information on Results. Washington: GAO, 2013. UNAIDS, AIDS by the Numbers (Geneva: UNAIDS, 2013). 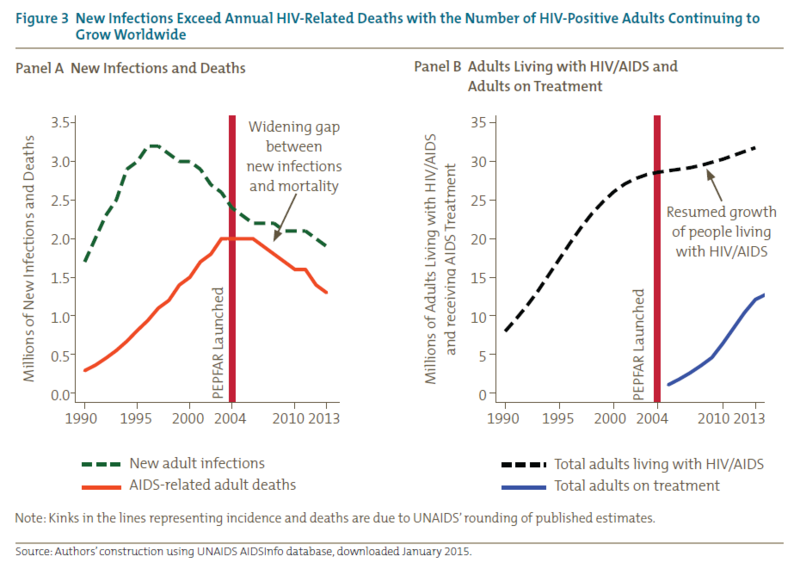 Kaiser Family Foundation, The Global HIV/AIDs Epidemic, fact sheet, December 1, 2014, http://kff.org/global-health-policy/fact-sheet/the-global-hivaids-epidemic/. U.S. Congress, Public Law 108-25 (2008). U.S. Congress, Public Law 110-293 (2008). U.S. Congress, Public Law 113-56 (2013). Kaiser Family Foundation, U.S. 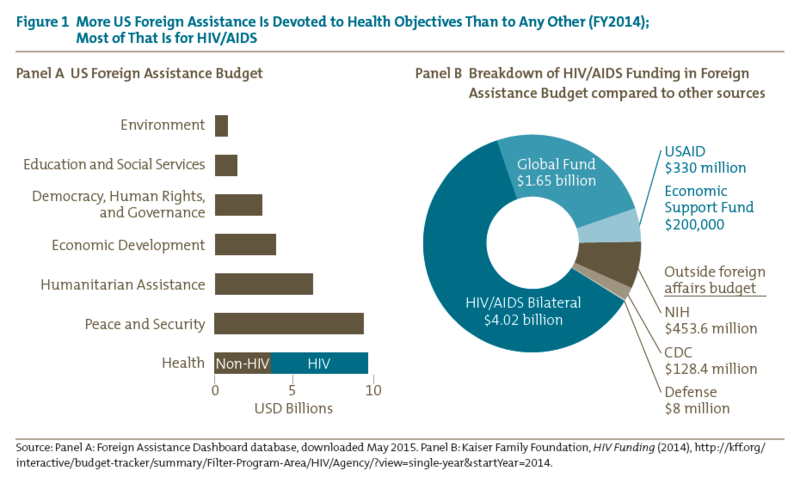 Global Health Funding for the President’s Emergency Plan for AIDS Relief (PEPFAR), FY 2001–FY 2013 (2013); Kaiser Family Foundation, U.S. Federal Funding for HIV/AIDS: The President’s FY 2016 Budget Request (2015), http://kff.org/global-health-policy/fact-sheet/u-s-federal-funding-for-hivaids-the-presidents-fy-2016-budget-request/. Mead Over discusses the obligations that the United States has incurred and the associated reputational advantages and risks. Mead Over, Achieving an AIDS Transition: Preventing Infections to Sustain Treatment (Washington: Center for Global Development, 2011). Unlike the World Bank, the Global Fund confines its assistance to three diseases, provides only grant financing, relates to a customized group called the Country Coordinating Mechanism rather than to the recipient government, and employs no in-country staff. Beginning in 2014, annual US financing of the Global Fund for its three diseases has exceeded its financing of the World Bank for all purposes, including not only health but also education, road construction, environmental protection, and so forth. Scott Morris, “Multilateralism-lite from the Administration and Congress,” Center for Global Development blog post, www.cgdev.org/blog/multilateralism-lite-administration-and-congress. Among PEPFAR-supported countries, new infections remain stubbornly higher than AIDS deaths in South Africa, Kenya, Mozambique, Uganda, Zimbabwe, Zambia, Cameroon, Lesotho, Botswana, Angola, Namibia, and Rwanda. Tanzania, Ethiopia, and Malawi have managed to push new infections below AIDS mortality, establishing the proof of concept. However, sustained effort will be necessary to keep new infections from rising there as they have already rebounded in Uganda. While Nigeria’s annual new infections are fewer than its AIDS deaths, that is due more to the weakness of its AIDS treatment program than to the effectiveness of its prevention policies. Over, Achieving an AIDS Transition. A previously discussed objective of adding more patients to AIDS treatment every year than the number of infections in that year, dubbed the “tipping point,” was not a useful strategy, since its apparent achievement in 2012 did not shrink the total number living with HIV/AIDS as reaching epidemic control would do. See table 1. Amanda Glassman, Victoria Fan, and Mead Over, More Health for the Money: A Practical Agenda for the Global Fund and Its Partners (Washington: Center for Global Development, 2013). The HPTN 052 randomized trial established the prevention benefits of treatment. Myron S. Cohen, Marybeth McCauley, and Theresa R. Gamble, “HIV Treatment as Prevention and HPTN 052,” Current Opinion in HIV and AIDS 7, no. 2 (2012): 99–105. Timothy B. Hallett and Mead Over, “How to Pay ‘Cash-on Delivery’ for HIV Infections Averted: Two Measurement Approaches and Ten Payout Functions,” Working Paper 210 (Washington: Center for Global Development, 2010), http://international.cgdev.org/publication/how-pay-“cash-delivery”-hiv-infections-averted-two-measurement-approaches-and-ten-payout. Institute of Medicine, Evaluation of PEPFAR (Washington, DC: National Academies Press, 2013). Center for Strategic and International Studies, The Future of the U.S. –South Africa HIV/AIDS Partnership (Washington: CSIS, 2013). In 2009 and again in 2011, PEPFAR has seemed to recognize that its contracting pattern is incompatible with its other goals and has promised to shift implementation responsibility away from US contractors and toward local contractors and national governments. In some places, such efforts are now under way, but success has been mixed in even the most developed recipients such as South Africa. As described in the 2013 Institute of Medicine Evaluation of PEPFAR. Nancy Birdsall and William D. Savedoff, Cash on Delivery: A New Approach to Foreign Aid (Washington: Center for Global Development, 2010); Over, Achieving an AIDS Transition. Rena Eichler and Ruth Levine, Performance Incentives for Global Health: Potential and Pitfalls (Washington, DC: Center for Global Development, 2009). See Hallett and Over, “How to Pay ‘Cash-on Delivery.’” Hallett and Over propose such a scheme and analyze the incentive properties of alternative payoff functions. The Office of Management and Budget has included a line item in the proposed 2016 budget for an “impact fund,” which Congress will hopefully endorse. The existence of such a line item would protect a small part of PEPFAR’s budget for experimentation with incentive programs. The country could be rewarded both for improved statistical power to reject the hypothesis of zero improvement (as suggested by Hallett and Over, “How to Pay ‘Cash-on Delivery’” and for agreement of its own measures with the results of an independent verification of its data. Johanne Pelletier, Jonah Busch, and Catherine Jeanne Potvin describe a related approach to accommodating imprecision in a program to reward emissions reduction in “Addressing Uncertainty Upstream or Downstream of Accounting for Emissions Reductions from Deforestation and Forest Degradation,” Climatic Change 130(4): 635–48.